As we sit down to watch the third and final Presidential Debate between President Barack Obama and former Governor Mitt Romney one thing is certain - President Obama's foreign policy failure in Benghazi shows he has lost the debate even before it begins. The murder of US Ambassador to Libya, Christopher Stevens, and three other Americans is the straw that breaks the camel's back when it comes to the most disastrous foreign policy of any president - including Jimmy Carter. In case you were wondering how the mainstream media was going to help President Obama cover this up, Reuters posted an article today entitled "After Libya misfire, pressure on Romney in foreign policy debate". Really? Was Romney President on Sept. 11 or during the period leading up to this "misfire"? The article goes on to say, "When President Barack Obama and Mitt Romney face off on Monday in their third and final debate, it will be the Republican challenger's last best chance to recover from his botched 'Libya moment'." Did I somehow miss the headlines about Romney taking over our government's Middle East policy? What about the series of "botched moments" of President Obama's that brought us to this disaster? 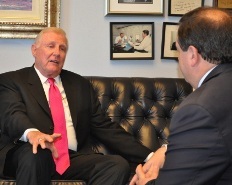 Recently, I had the opportunity to speak with several Members of Congress about President Obama's failures in the Middle East and how those policies directly lead to the murderous terrorist attack that occurred in Benghazi on September 11, 2012. After all, Obama is still the President and is the one who is really responsible for what happens, right? Congressman Dan Burton (R-IN), spoke to me about Obama's lack of foreign policy experience combining with a left leaning philosophy saying, "I think the president, first of all, has no experience. Two years as a state senator, two years as an United States senator and now president of the most powerful country on Earth, what we thought was the most powerful country on Earth, still is, but if he has his way, I'm not sure we're going to keep that position, and I think it's a probably a combination of both incompetence and I think he has a very liberal attitude." These comments were made during an interview in his Washington, D.C. office literally moments before Ambassador Stevens was killed. Burton concluded saying, "... this Administration, I know a lot of people aren't paying attention to it, and they may not agree with what I'm saying, but I'm telling you, this Administration has really hurt the United States and our future foreign policy. It's a disaster, and I think it's very likely we're going to see a major conflict over there because of this Administration." Moments later, the compound in Benghazi came under attack and Stevens and four others were dead. 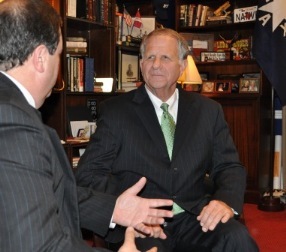 In the following video interview with Houston Congressman Ted Poe (R-TX) you will hear some of the questions the media should be asking President Obama and hopefully Gov. Romney will ask tonight. Congressman Poe asked, "What is the real foreign policy of the United States when it comes to the Middle East? What is our policy when our embassy is attacked?" I asked Poe if it looks like Obama's illegal war in Libya led to the consequences we have seen unfold in the months after that. Poe replied, "To me, it seems this was not just a coincidence. That both of these attacks (Egypt and Libya) happened on the same day. They both happened on the anniversary of 9-11, they were acts of terror, like 9-11. Americans were killed - like 9-11. It looks like these were planned, I think coordinated, attacks. Our U.S. Ambassador was murdered. The embassy in Cairo and Benghazi were both attacked. That's American sovereign soil. People died because of this. Of course, they [the Administration] blamed some movie that came out some time ago. They [the terrorists] need to be held personally accountable." In the following video, Fox News Channel Reporter Bret Baier presents "Death and Deceit in Benghazi." This report is the most complete coverage I have seen about the timeline leading up to the attack and the Ambassador's murder. The video is 41 minutes, but it is a must watch if you have not made up your mind about what happened and why this Administration cannot be allowed to continue making foreign policy for this nation. 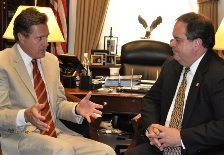 I also spoke with Congressman Mike Turner (R-OH) about the President's failed policies. Turner described Obama's foreign policy as a failure stating, "So now we are in the aftermath of that action where the president is sitting with an ill-defined policy and Americans have been killed and our country is still at risk." He summed it up saying, "I think this calls into question the President's whole strategy on Libya and the Middle East. When the President went in to remove Muammar Gaddafi, he did not have an exit strategy, a transition plan, or even an understanding of who the insurgents were - what government would result from that - the geopolitical view of that government toward its neighbors or specifically even toward us." That pretty much sums it up. The Obama Administration has failed us on so many levels but the worst has to be the abject bumbling of foreign policy. Especially the policies related to the Middle East, North Africa and Israel. 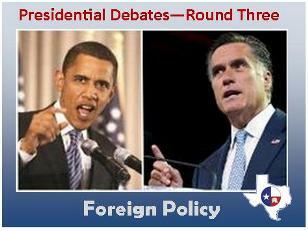 The reality is, Obama has lost this debate on foreign policy before he ever utters a word on the stage tonight. The media must hold him accountable, but we know they will not. It is left to us - WE THE PEOPLE - to make this right and remove him from office by our votes cast between today and November 6th.